This article is about the Giulia Sedan of 1960s and 1970s. For the Giulia coupes of same era, see Alfa Romeo 105/115 Series Coupés. For upcoming Giulia sedan, see Alfa Romeo Giulia (2014). The Alfa Romeo Giulia (105 series) is a sports sedan. Alfa was one of the first manufacturers to put a powerful engine in a light-weight car for mainstream production. The Giulia weighed about 1,000 kilograms (2,205 lb). The car was equipped with a light alloy twin overhead camshaft four-cylinder engine, similar to that of the earlier Giulietta models range. Engine capacities offered were 1.3-litre (1,290 cc) or 1.6-litre (1,570 cc). Various configurations of carburetors and tuning produced power outputs from about 80 to about 110 bhp (55 to 75 kW). Almost all Giulias made had a 5-speed manual transmission. Giulias were noted for their lively performance among sedans of that era, especially considering the modest engine size. The popular Super version with the twin carburettor 1.6 litre engine had a top speed of 170 km/h (106 mph). 0 to 100 km/h (62 mph) took about 12 seconds. This performance was better than many sports cars of the late 1960s and early 1970s. When leaving the factory all variations of the Giulia originally fitted either Pirelli Cinturato 165HR14 tyres (CA67) or Pirelli Cinturato 155HR15 tyres (CA67). The styling was quite straight forward, but with a great amount of detail. The engine bay, cabin and boot were all square shaped. But the grill, the rooflines and details on the bonnet and boot made for an integrated design from bumper to bumper. It was also a car with a particularly low drag coefficient for that era. For example, the drag coefficient of the Giulia was lower than that of a Porsche 911 from the same period. Giulia Ti: Tipo 105.14 was the first model introduced in 1962. 1,570 cc Alfa Romeo Twin Cam engine with single down-draft carburettor, 92 PS (68 kW; 91 hp) at 6500 rpm. The "Ti" nomenclature referred to a class of Italian saloon car racing known as "Turismo Internazionale", and had previously been applied to higher-performance versions of the 1900 and Giulietta saloons in the 1950s. However, for the Giulia saloon, the Ti was at first the only version available, and later, with the introduction of the TI Super and Super, the TI became the base version for the 1,600 cc engine class. Steering column gearchange (the only one in the Giulia range) replaced with floor change for 1964 (Tipo 105.08). Right hand drive available from 1964 with floor change only (Tipo 105.09). Brakes were by drums all around at first. Discs were introduced later, first at the front, and later all around. A brake servo was not fitted at first, but was introduced in later cars. The steering wheel featured the only horn ring ever in the Giulia range. The dashboard with a strip speedo is a notable feature, as is the steering wheel with a horn ring. 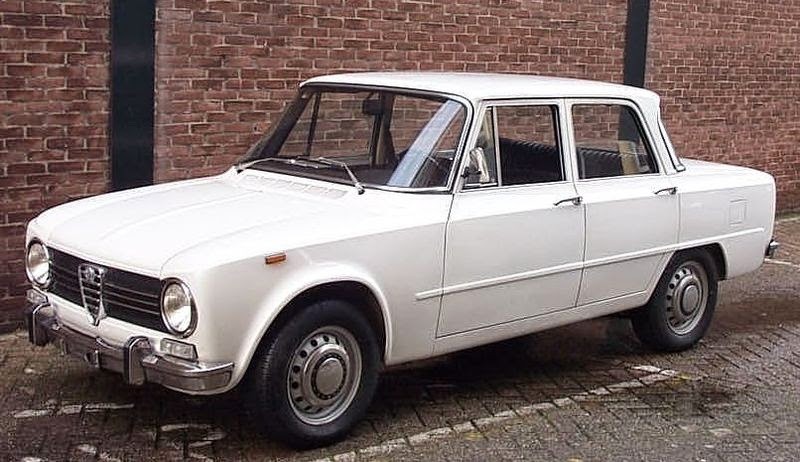 The Giulia TI was phased out in 1968 and re-introduced as the austerity model 1600 S (see below). Giulia Ti Super: Tipo 105.16 was a special racing model introduced in 1963. Quadrifoglio Verde (green four-leaf clover) stickers on the front wings were a distinguishing feature. Only 501 were made for homologation and today it is very rare and desirable. The 1,570 cc engine was fitted with two double-choke horizontal Weber 45DCOE carburettors for 112 PS (82 kW; 110 hp) at 6500 rpm. The body was lightened and a floor gearchange was fitted as standard, as were alloy wheels of very similar appearance to the standard steel ones of the TI. The TI's instrument cluster with its strip speedometer was replaced with a three-instrument binnacle comprising speedometer, tachometer and a multi-gauge instrument (fuel, water temperature, oil temperature and pressure) - these instruments were similar to those fitted to the contemporary Giulia Sprint and Sprint Speciale coupes and Spider convertibles. The steering wheel was a three-spoke item with centre hornpush, also similar to that of the more sporting models. Braking was by discs all around from the outset, though the first cars lacked a servo which was introduced later. Giulia 1300: Tipo 105.06 was an austerity model made from 1964 to 1970 with a 1,290 cc single-carburettor engine for 78 PS (57 kW; 77 hp) at 6000 rpm. Four-speed gearbox with floor change fitted as standard (the 1300 was the only Giulia model not fitted with a five-speed gearbox). Though the engine was given a 105 series type number, it was basically the engine from the 101 series Giulietta Ti. This model appears not to have been exported to many markets outside Italy, if at all. Braking was by discs all around, without a servo at first, later with a servo. 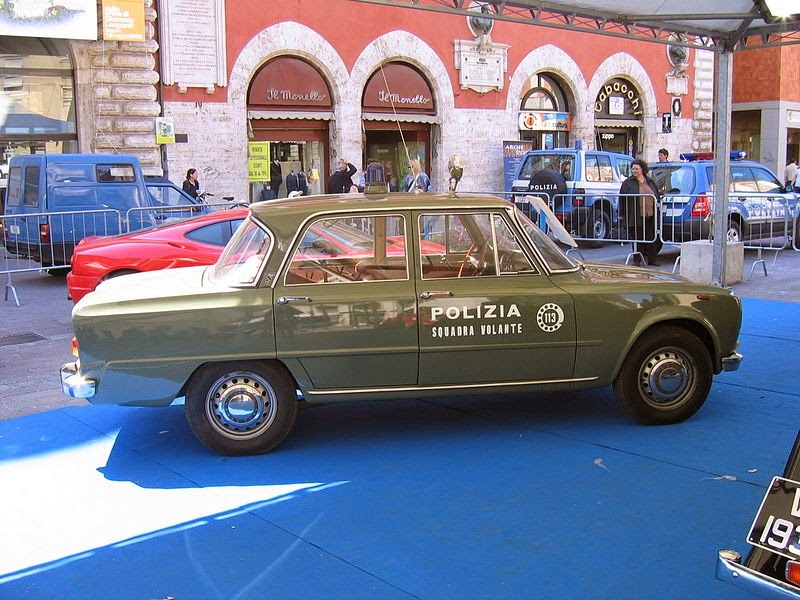 Giulia Super: Tipo 105.26 was introduced in 1965. It transferred the technology from the racing TI Super to a road car, to make the most successful Giulia saloon. 1,570 cc engine with two double-choke Weber 40DCOE carburettors for a milder, but torquier tune than the TI Super - 98 PS (72 kW; 97 hp) at 5500 rpm. New dashboard with two large round instruments (speedo and tacho) and clock. Sportier steering wheel with three aluminium spokes and centre horn push, similar to that of the Ti Super, later changed for one with the horn pushes in the spokes. All-around disc brakes with servo were fitted as standard from the outset. The serpent crest of the Sforza family appears in a badge on the C-pillar and is a distinguishing feature of the Super. For 1968, there was a suspension update, including revised geometry and a rear anti-roll bar. The wheels were changed in size from 5J x 15 to 5J x 14, and tires from 155/15 to 165/14. For 1970, updates included dual-circuit brakes, centre-mounted handbrake lever to replace under-dash "umbrella handle", larger external doorhandles, and top-hinged pedals (the latter in left hand drive models only; right hand drive continued with bottom-hinged pedals to the end of production). 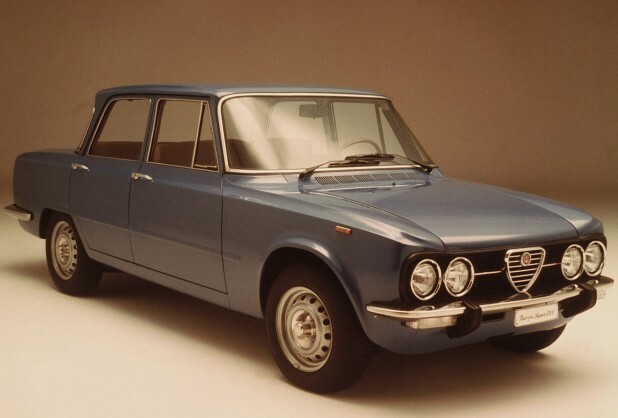 In 1972, Tipo 105.26 was rationalised into the Giulia 1.3 - Giulia 1.6 range (see below). Giulia 1300 Ti: Tipo 105.39 built from 1965 to 1972. Right hand drive model replaced in 1970 by the 1300 Super (see below). 1,290 cc engine with single down-draft carburettor for 82 PS (60 kW; 81 hp) at 6000 rpm. 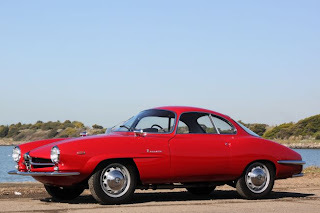 Unlike the re-deployed 101-series Giulietta engine of the austerity-model 1300, the 1300 Ti motor was a 105 series engine, basically that of the sportier GT1300 Junior coupe with different camshaft timing (but the same camshafts) and induction system. Five-speed gearbox. Three-spoke bakelite steering wheel with plastic horn push covering the centre and spokes. Dashboard initially with strip speedo like that of the TI. For 1968, updates included a dashboard based on that of the Super, but with a simpler instrument binnacle, still featuring two large round instruments (speedo and tacho) and a separate fuel gauge, and the same suspension, wheel and tire updates applied to the Giulia Super in the same year. For 1970, updates included dual-circuit brakes, centre handbrake, larger external doorhandles and top-hinged pedals (on left hand drive cars only), again as applied to the Super for that year. 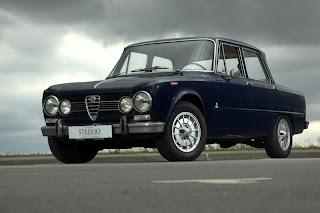 Giulia 1600 S: Tipo 105.85 was basically a Giulia Ti re-introduced in 1968 as a lower-level model to come between the 1300 and 1300 Ti on one hand, and the Super on the other. It had a re-interpretation of the 1,570 cc single-carburettor engine for 95 PS (70 kW; 94 hp) at 5500 rpm and similar trim to the 1300 Ti. Replaced in 1970 by the 1300 Super (see below) which offered similar performance in a lower tax bracket. The last cars from 1970 featured the top-hinged pedals, centre handbrake and dual-circuit brakes as for the Super and 1300 Ti. 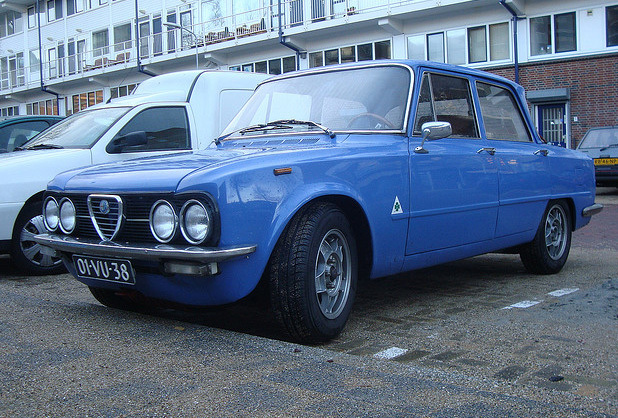 Giulia Super 1300: Tipo 115.09 was introduced in 1970. It was basically a 1300 Ti fitted with the engine from the GT 1300 Junior coupe that featured two double-choke horizontal carburettors; the engine actually had the GT 1300 Junior type number. 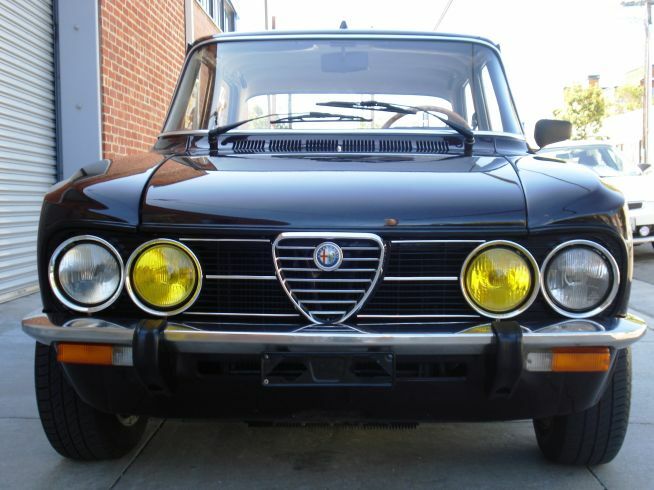 This model was rationalised into the Giulia Super 1.3 - Giulia Super 1.6 range in 1972. Giulia Super 1.3 and Giulia Super 1.6: In 1972 a rationalisation of the Giulia range saw the Super 1300 (Tipo 115.09) and the Super (Tipo 105.26) re-released as the Super 1.3 and Super 1.6. The two models featured the same equipment, interior and exterior trim, differing only in engine size (1,290 cc and 1,570 cc) and final drive ratio. The 1300 Ti was dropped. A small Alfa Romeo badge on the C-pillar is a distinguishing feature, as are hubcaps with exposed wheel nuts. Nuova Super 1.3 and Nuova Super 1.6: The Giulia Super range was re-released in 1974 as the Nuova Super range. This dropped the Giulia name and featured a new black plastic front grille and a flat boot (trunk) lid without the characteristic centre spine. Otherwise the cars differed little from their Giulia Super predecessors and bore the same Tipo numbers with an S suffix. Production ceased in 1977. Nuova Super Diesel: A Nuova Super fitted with a Perkins 1,760 cc diesel for 55 PS (40 kW; 54 hp) at 4000 rpm. The firm's first attempt at diesel power. 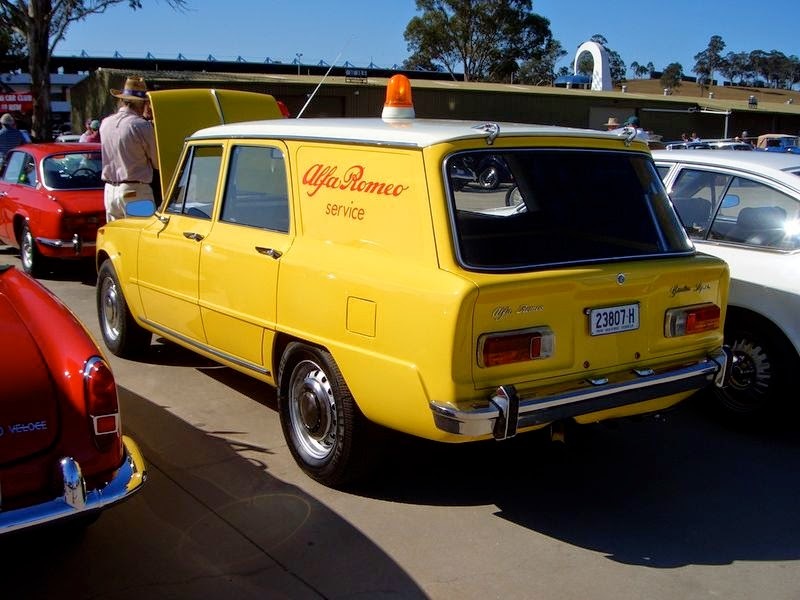 The same Perkins diesel was used also in Alfa Romeo F12 van. The diesel version was slow, 138 km/h (86 mph), and the engine somehow unsuitable for a sport sedan so it was not big seller, only around 6500 examples made in 1976. The Spider, Sprint and Sprint Speciale Giulias introduced together with the Giulia sedan in 1962 were rebadged and updated versions of earlier Giulietta models (series 101), now with a 1.6 litre instead of a 1.3 litre engine. 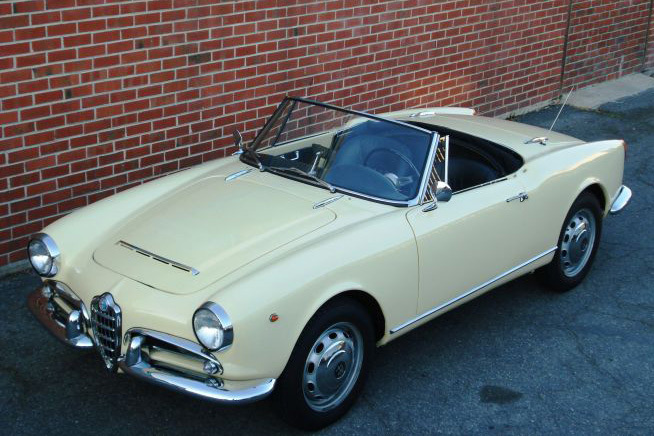 Easiest to distinguish from a Giulietta is the Spider, which featured a bonnet bulge to clear the slightly taller engine. The Sprint coupe was also available for a short time with the 1.3 litre engine as the Sprint 1300 - essentially a Giulietta Sprint with a different name. Most models were discontinued in 1964. The Sprint Speciale continued until 1966. Last updated on 3 February 2014 at 10:11.